The Appomattox Campaign was a series of battles fought March 29 – April 9, 1865, in Virginia that culminated in the surrender of Confederate General Robert E. Lee's Army of Northern Virginia and the effective end of the American Civil War. The campaign was contested along the evacuation routes from Richmond, Virginia, and Petersburg, Virginia, following the routes of the Richmond and Danville Railroad and the Southside Railroad west to Appomattox Court House. At the conclusion of the Richmond-Petersburg Campaign (also known as the Siege of Petersburg), Lee's army was outnumbered and exhausted from a winter of trench warfare over a nearly 40 mile front, numerous battles, disease, and desertion. At the Battle of Five Forks on April 1, Union forces under Lt. Gen. Ulysses S. Grant cut the final railroad line supplying Lee's army in Petersburg, and ordered a general assault along the Petersburg fortification line. On April 2, Grant's army achieved a breakthrough of the lines in the Third Battle of Petersburg, which prompted Lee to order the evacuation of both Petersburg and the Confederate capital of Richmond on the night of April 2–3. Lee hoped to withdraw to the southwest and unite his army with Confederate forces in North Carolina, but Grant's army pursued relentlessly. On April 6, Lee's army suffered a significant defeat at the Battle of Sayler's Creek, but continued to move to the west in an attempt to elude the Union Army. Cornered, outnumbered, and short of supplies, Lee finally agreed to surrender his army on April 9 at Appomattox Court House. The Appomattox Campaign consisted of the following Civil War battles: Battle of Lewis's Farm; Battle of White Oak Road; Battle of Dinwiddie Court House; Battle of Five Forks; Battle of Petersburg III; Battle of Sutherland's Station; Battle of Namozine Church; Battle of Amelia Springs; Battle of Sailor's Creek (aka Sayler's Creek); Battle of Rice's Station; Battle of Cumberland Church; Battle of High Bridge; Battle of Appomattox Station; and Battle of Appomattox Court House. Union forces under Lt. Gen. Ulysses S. Grant had besieged Lee's army around the city of Petersburg, Virginia, since June 1864. The two armies spent the winter in an elaborate series of trenches and fortifications, stretching over 30 mile from the outskirts of Richmond to Hatcher's Run southwest of Petersburg, foreshadowing the tactics to be used in World War I. As Grant had inched to the west over the winter, the Confederates extended their lines to compensate, but they were stretched too thin, having only about 1,000 men per mile of defensive line. Lee knew that his army could not survive a siege indefinitely and looked for ways to escape his predicament as spring arrived, the rains diminished, and the local road system became passable again. The Appomattox Campaign was preceded by the Battle of Fort Stedman on March 25, 1865, the concluding battle in the Richmond–Petersburg Campaign. This failed attempt by Lee to break the siege resulted in heavy Confederate casualties. 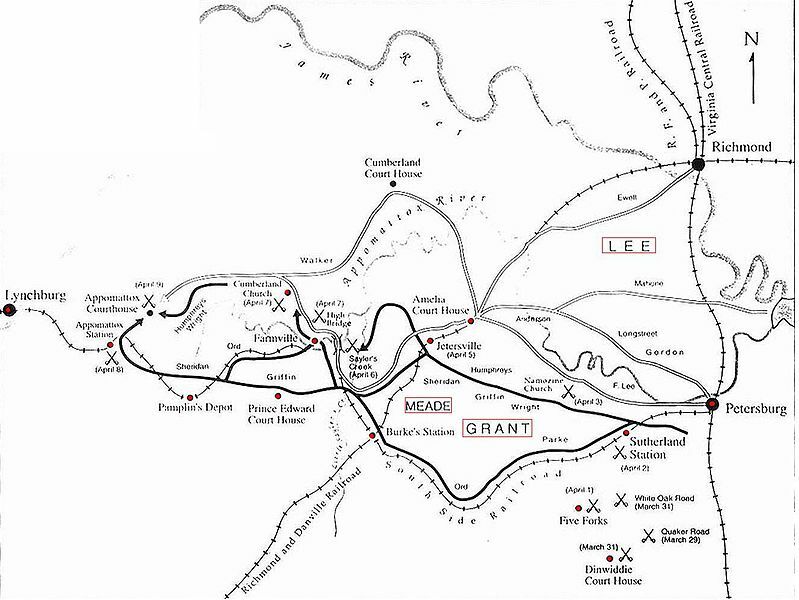 Lee knew that Grant would soon move against the only remaining Confederate supply line, the South Side Railroad, and that would doom his army. Lee was by now the commander of all Confederate armies. (Despite his fame throughout the Confederacy, for almost three years Lee had commanded only the army in northern Virginia.) His plan was to extricate himself from the Federal grip at Petersburg, withdraw to the southwest, resupply his starving army at Lynchburg, Virginia, and head south. There, the Army of Northern Virginia might be able to link up with Gen. Joseph E. Johnston's forces in North Carolina, defeat the Union army under Maj. Gen. William T. Sherman that was pursuing Johnston, and then return to strike a combined blow at Grant. In preparation for his breakout, he moved forces to his right flank. Grant, meanwhile, brought additional forces to bear. Maj. Gen. Philip Sheridan had returned with 5,700 cavalrymen from the Shenandoah Valley. Maj. Gen. Edward Ord's Army of the James came up to the Petersburg lines, which freed up two corps of Maj. Gen. George Meade's Army of the Potomac for offensive action against Lee:the II Corps under Maj. Gen. Andrew A. Humphreys and the V Corps under Maj. Gen. Gouverneur K. Warren. The Appomattox Campaign was a series of Civil War battles fought March 29 – April 9, 1865, in the Commonwealth of Virginia that concluded with the surrender of Gen. Robert E. Lee's Army of Northern Virginia to the command of Lt. Gen. Ulysses S. Grant, commanding Army of the Potomac, Army of the James and Army of the Shenandoah. In the following eleven weeks after Lee's surrender, the American Civil War ended as other Confederate armies surrendered and Confederate government leaders were captured or went into exile. As the Richmond–Petersburg Campaign (also known as the Siege of Petersburg) ended, Lee's army was outnumbered and exhausted from a winter of trench warfare over an approximately 40 mile front, numerous battles, disease, hunger and desertion. Lee's command would dwindle to less than 28,000 effectives, while Grant's army would field more than 100,000, with fresh troops arriving daily. Lee was not receiving replacements or new units, but was faced with the grueling task of feeding his men, who were now starving but expected to march and fight the well-equipped and rested Union juggernaut. The end was near, but Lee was determined to explore and exhaust his options. Grant's well-equipped and well-fed army was growing in numbers. On March 29, 1865, the Union Army began an offensive that stretched and broke the Confederate defenses southwest of Petersburg and cut their supply lines to Petersburg and the Confederate capital of Richmond, Virginia. Union victories at the Battle of Five Forks on April 1, 1865 and the Third Battle of Petersburg, often called the Breakthrough at Petersburg, on April 2, 1865, opened Petersburg and Richmond to imminent capture. Lee ordered the evacuation of Confederate forces from both Petersburg and Richmond on the night of April 2–3 before Grant's army could cut off any escape. Confederate government leaders also fled west from Richmond that night. The Confederates marched west, heading toward Danville, or Lynchburg, Virginia as an alternative. Lee planned to resupply his army at one of those cities and march southwest into North Carolina where he could unite his army with the forces commanded by Gen. Joseph E. Johnston. Grant's Army pursued Lee's fleeing and exhausted troops relentlessly. During the next week, the Federals fought a series of battles with Confederate units, cut off or destroyed Rebel supplies and blocked their paths to the south and ultimately to the west. On April 6, 1865, the Confederate Army suffered a significant defeat at the Battle of Sailor's Creek, Virginia, where they lost about 7,700 men killed and captured and an unknown number wounded. Nonetheless, Lee continued to move the remainder of his battered army, some 28,000 men, to the west and attempted to break the Union line, which was in the process of completing an envelopment. Soon cornered, short of food and supplies and outnumbered by Grant's army of 100,000, Lee surrendered the Army of Northern Virginia to Grant on April 9, 1865 at Appomattox Court House, Virginia. Sources: Calkins, Chris. 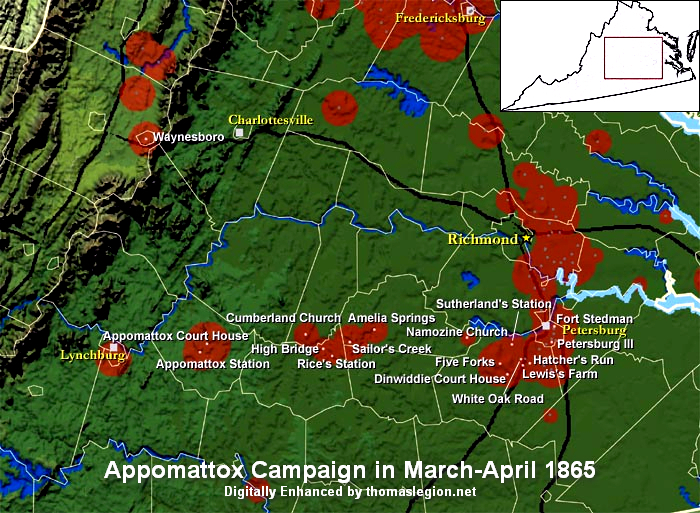 The Appomattox Campaign, March 29 – April 9, 1865. Conshohocken, PA: Combined Books, 1997. ISBN 978-0-938289-54-8; Esposito, Vincent J. West Point Atlas of American Wars. New York: Frederick A. Praeger, 1959. OCLC 5890637; Kennedy, Frances H., ed. The Civil War Battlefield Guide. 2nd ed. Boston: Houghton Mifflin Co., 1998. ISBN 0-395-74012-6; Korn, Jerry, and the Editors of Time-Life Books. Pursuit to Appomattox: The Last Battles. Alexandria, VA: Time-Life Books, 1987. ISBN 0-8094-4788-6; Marvel, William. Lee's Last Retreat: The Flight to Appomattox. Chapel Hill: University of North Carolina Press, 2002. ISBN 978-0-8078-5703-8; Salmon, John S. The Official Virginia Civil War Battlefield Guide. Mechanicsburg, PA: Stackpole Books, 2001. ISBN 0-8117-2868-4.